The Tuesday steam groups fitted steam heating pipes to Henry Ellison ready for it's visit to the North Yorkshire Moors to heat the Santa train coaches and once again more small parts were engineered for Cathryn. The first day of the GMT saw a cold but sunny day. It was reasonably busy for the time of year with passengers enjoying Iris today. Down the yard, a small army tackled jobs on TSO 4440 but I am not exactly sure what. A cold start to today's activity's. The single unit 55006 "Bubble Car" catered for 115 passengers who travelled on our train today. Thanks to the train crew who kept the service on time, incidentally we had three different 3rd men today who operated the crossing gates on the services. Thanks for the support from catering, the bookshop and booking office also. Thanks to Richard for conducting his famous tours of the shed and yard activities. Also to Julie for selling some more "150 Years of the Wirksworth Branch" on board our services. Down the yard the activities continued on different types of rolling stock. SO 4440 having its bodywork refurbished, Ruston loco "Faraday" was having attention to it's starting air reservoir, 50253 "B" Exam attention, EVRA coach work on internal wiring, LMSCA working on interior of LMS BTO. Steam Team working on the "The Duke" s cylinder lubrication and coupling up of con rods and cross heads. Finally two new potential volunteers were shown around our facilities to possibly recruit them to our family of railway volunteers. Today we hosted a charter for the National College of High Speed Rail who were doing a project on improving infrastructure. They came from Birmingham and enjoyed tours round and talks from Richard and Pete around the yard and the new Maintenance Facility. Elsewhere, work continued on creating an on ramp for the cherry picker to mount a wagon and the Maintenance Team worked on a fuel starvation issue that keeps recurring on 50253. The PWay continued with fishplate greasing and sleeper changing in the Hazlewood area. A never ending task !! A cold, blustery and wet day saw it be fairly steady on the trains which I suppose is to be expected given the circumstances. Down the yard, a shunt was had to ensure all of the projects are in the right place and work continued apace on the repaint of the Class 33. A representative from the owning group came and did some engine maintenance on it, looking at a troublesome oil strainer which has been leaking for a little while. Also in the shed (best place to be), work continued on the bodywork of the BSK and the fitting of ETH parts and the recently arrived Tourist Second Open became, well, just Open...completely. A very wet and miserable day but it didn't deter the chaps from their work. Firstly, they started constructing an area at the edge of the old dock wall which will enable the cherry picker to drive onto a wagon for transport down the line. This was so wet though they then decided to go down the line with the train to transport the building materials for the new crossing huts from Idridgehay to Gorsey Bank instead. 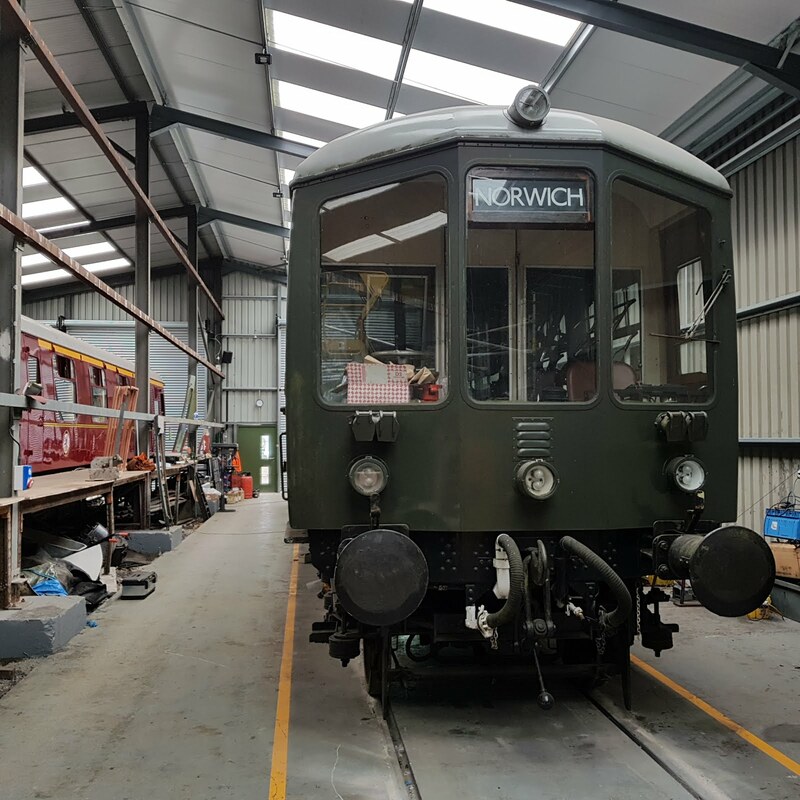 The Maintenance Team were examining a DMU car which goes on the Santa train, but stuck to mainly inside jobs understandably. The Pway team continued sleeper changing between Hazlewood and Shottle and change d 15 on Wednesday. An average but quite mild autumnal day in valley, which meant that the low down sun was really beautiful with colours of the leaves down the line. The buffet had a particularly good day though for the time of year. Down the shed, work continued on the restoration of Faraday, the PW Bubble had the underframe steam cleaned now the cleaner is working and the Maintenance Team started end of season coach examinations which will enable them to write up a programme of winter maintenance so that we can start well next season. Derbyshire's favourite branch line enjoyed surprisingly mild and dry weather today. 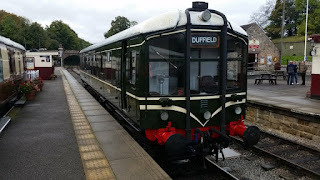 The 'Bubble Car' carried good passenger loadings throughout the day and the train crew facilitated a number of cab visits from Lee and Holloway Scouts as they journeyed along the valley to Duffield before embarking on a hike to Crich. 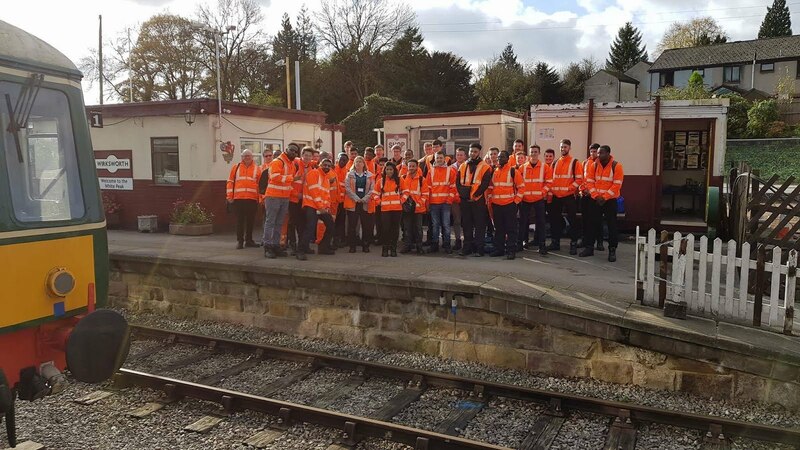 We also played host to a number of groups today with The Derby Lightweight Group holding their AGM in their unit on platform three and the '48624' Locomotive Group holding their AGM in the training room. John Ball also held a first aid course for our volunteers. In the shed the Permanent Way bubble car had attention to the guard's door and Faraday received a new headlamp. The new CCTV cameras were installed and tested. Today's service was supported by the EVRA shop, booking halls and Pullman Buffet. 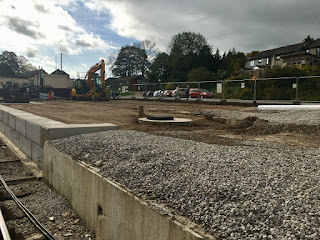 For those who have not visited Wirksworth Station recently I have attached a photo of the work taking place on the base of the new station building. It is a major project and there are a number of ways that people can support the new build. A new page has been created on our website so please help us by telling your family and friends about the project and the ways they can gift funds. Finally, tonight we ran a full train (160 passengers) to Duffield on our Jazz and Chips Special. A big thank you to those staff and volunteers who have given their time freely this evening to ensure our guests have a good time. The dreaded Friday 13th seems to have passed without a hitch, in fact, it has been reasonable. The main area of work today was on the PW Bubble car with the other engine being fitted to the vehicle. This engine was successfully run up on a pallet earlier this week but did require a few tweaks to leaking pipework before fitting. Anyway, it has been happily fitted this week so the vehicle now has both engines in situ. There's still quite a bit of work to do before the vehicle will actually move, not least with the electrics and bogie swap. The Commercial Department saw strong Santa sales today, with one of the trains on Christmas Eve already showing a 'Yellow' on the website, meaning that it is nearly full. I think this might be the earliest a 'Yellow' has come up. Down in the deep south, a start was made on refreshing the paintwork on the station benches. They can do this in their cabin in the dry. As the day was getting late, Team Faraday arrived to do some evening bodywork in the shed on the locomotive. You could for forgiven for thinking that on a somewhat overcast and chilly early October day activity around our enterprise would be equally subdued but nothing could be further from the truth, I counted in excess of 20 volunteers at our northern terminus alone all busy with a wide range of activities, where to start..? Early doors Aubrey was starting a repair on the water pump used to keep the water out of the inspection pit outside the ever expanding Enginerium, a combination of rain and surface water means this fills quite quickly meaning it is useless without the pump working. You can imagine how inviting a prospect this task is but by the end of the day the pit was indeed free of its volume of water, another behind the scenes but no less essential task successfully completed. The inside the Enginerium (pictured attached) continues to be enhanced massively and is really turning into a very impressive and capable facility for us. Ben was working on what can really only be described as the re-engineering of the Derby Light Weight power car as its air and electrical systems are replaced to make it compatible with the rest of our fleet. In another corner Faraday, now supported by its appreciation group certainly appreciates the replacement of major bearings, compressors, panels and many other aspects of this vehicle that will in the fullness of time return it to full service. Finally Derek and others were working on several of our carriages around the site which again will enhance our fleet of coaching stock for the future. So that was it right.?...wrong.. Passenger services were today staffed by John, Julie, Pat, Howard and Kyle and of course not to forget Iris (picture attached). It is indeed fortunate we had full train crew because as they left Duffield just after 11am nearly 40 guests were on board to enjoy the trip up the Ecclesborne valley and significant passenger numbers carried on for the rest of the day. One party on this service were gathered for a significant birthday and the birthday girl was taking on a yard tour by Phil later in the afternoon which was clearly well received. The catering team were busy all day and catered for a pre-booked afternoon tea alongside the usual business of the day, Frank had a busy day in the gift shop and Andy and Nick ensured our guests were looked after at our northern and southern booking offices. As I returned home crowds were gathering in Matlock Bath for this evening hallucinations, you will remember this event from previous years, its the one involving those traffic wardens trained by special forces. They were indeed observed outside the Pavilion limbering up and counting flash bangs, the brief traffic delay gave me opportunity to reflect on the large number people who contribute their time to ensuring our railway runs so smoothly and continues to grow day by day. Today we hosted two charters. 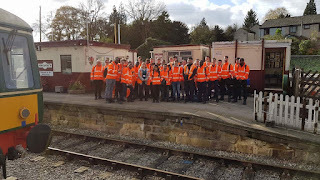 The first was for East Midlands Trains and the Community Rail Awards Group who enjoyed a ride from Duffield to Wirksworth and back again. This was helped by expertly swift catering in the Pullman with sandwich grab bags made up and the team being quick with the hot drinks flasks. They only had 20 minutes at Wirksworth before their return! Then, this afternoon we hosted another charter which enjoyed tea and biscuits in the Pullman before a return journey to Ravenstor and a single to Duffield with onward mainline travel. Down the yard, the team fitted a reconstructed Leyland 680 engine to the PW Bubble. The engine has had quite a lot of work done to it over recent weeks which culminated in a successful start up on a pallet yesterday. The engine is now hung up and awaits piping up and the wiring doing. Further work was done on the new Station Building project at Wirksworth, with these giant concrete 'Lego' bricks being lifted in to place and lorries arriving with backfill. It is hard to imagine the model railway container and weighbridge ever being there now. Stuart the Foreman continued his quest to repair the wooden window frames of the Managerial Office/Ladies building. A damp, miserable and generally dark day today but still the train happily rasped up and down to the Blue Timetable. We had some reasonable loadings but I suppose one can't expect too much in October! Down the yard, a start was made on the post-season coach fleet examinations which will enable the teams to draw up a list of work required in the closed season so we can hit the ground running come March. The coaches clocked up the most mileage they have ever done this season and this exercise will prove most useful.